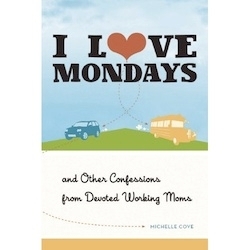 Michelle Cove is the author of I Love Mondays: And Other Confessions from Devoted Working Moms and the editor of 614: the HBI ezine, an online magazine that aims to spark conversation on hot topics for Jewish women. Michelle is also the mother of an 8-year old girl. In her free time, she writes books and gives talks around the country. She chatted with us recently about the working mom guilt, avoiding burnout, and how important it is for our kids to see us fulfilled. What prompted you to add the word “confessions” to the title of your book? Do you really find there’s a stigma attached to mothers who enjoy working outside the home? The word confessions is in the title because working moms, even the most confident ones, have occasional doubts and insecurities about whether we’re giving enough to our kids, especially when work obligations and deadlines tug at our attention. We don’t often reveal our doubts and concerns with one another but we could really help one another if we did. Here at Kveller we talk a lot about how important it is to tell the truth, when it comes to all issues of parenting, to other parents. But the truth (ha ha) is that lots of moms still don’t cop to how they make it (or don’t make it) work. Why do you think we’re still so cagey? I think many of us worry that if we open up to others about how hard it is to make it work, we may be judged, condoned, and possibly challenged about whether we should be working at all. It seems easier to keep it bottled up inside. Women also sometimes falsely believe other working moms aren’t struggling at all with guilt and logistical hassles, but I assure you all of us experience the tug-of-war between work and parenting. The more we open up with one another, the more women will realize this and perhaps help each other with strategies we’ve tried. I loved how you write in your intro that “We’re all sick of pointless and pressure inducing mantras like ‘find the balance’ and ‘have it all. '” This kind of honesty is refreshing because there’s no such thing as having it all. What are some of the sacrifices you’ve made in order to make it work? Oh, you know…there is a meeting I need to attend across the country on the same day as my daughter’s recital; I am about to give an important presentation when the school nurse calls and says come get your child; I’ve got to leave work early to pick up my daughter from camp; I can’t give my daughter a hug after a bad day (hers or mine) because I’m at a conference. In the big picture, I spend a lot of time with my daughter and am getting better at staying in the moment when I’m with her, rather than half-thinking about work. But that said, these sacrifices pop up often and always hit the “guilt” button. Two important tips for avoiding burnout when parenting and working? One: spend the first three to five minutes of each day lying in bed, taking deep breaths, and thinking the word “calm” on the exhale. Or, sometimes on the exhale I think about things I’m grateful for. It allows me to start the day feeling more grounded and centered so that when my daughter is crying because she can’t find her library book or she has spilled cereal everywhere, I’m better equipped to deal with it and not get all stressed out. Two: use commute time for relaxing, assuming the kids aren’t in the car with you. I learned while interviewing working moms around the country that commute time is used mostly for worrying about work and family because it’s a period of time when we’re in limbo–not at work, not at home. Instead I advise women to intentionally think about commute time as a time to replenish, whether it’s doing crossword puzzles on the train or bus, listening to podcasts or music in a car, or whatever helps you to relax. That’s a particularly good one, considering I am sitting on the train editing this interview and not replenishing. What other advice do you have for women who are looking to reinvent their careers now that they’re mothers? We’re at a time when over 70% of women with a child age 1 or older are working. Most families need the paycheck. That said, as we discussed, there are many sacrifices and struggles when it comes to balancing work and parenting so if it’s at all possible to find work you’re excited about, that goes such a long way. It’s not only going to be more fulfilling for you–which is one of the main reasons women love going to work–but it’s wonderful for your sons and daughters to see that you experience joy from your own achievements and not just theirs. follow her on Facebook, and check out The HBI ezine. Buy I Love Mondays on Amazon and a portion of the proceeds will help support Kveller.